Israel installed new security cameras Sunday at the entrance to Har HaBayis, as officials began indicating it was considering “alternatives” to the metal detectors that set off a weekend of violence and raised tensions in the region. Israel set up the new security measures last week after Arab terrorists opened fire from Har HaBayis, killing two Israeli policemen. Maj. Gen. Yoav Mordechai, who heads the Israeli defense body for Palestinian civilian affairs, said Israel was open to alternatives to lower the tensions. Overnight Motzoei Shabbos, police set up an array of cameras at the entrance to Har HaBayis, with rumors swirling overnight that the current security measures would be removed. The cameras are said to be high-resolution cameras, which will make it easy for police to check the identity of those entering the site, and to determine if any of those trying to enter poses a threat – with police standing by to arrest targeted threats. 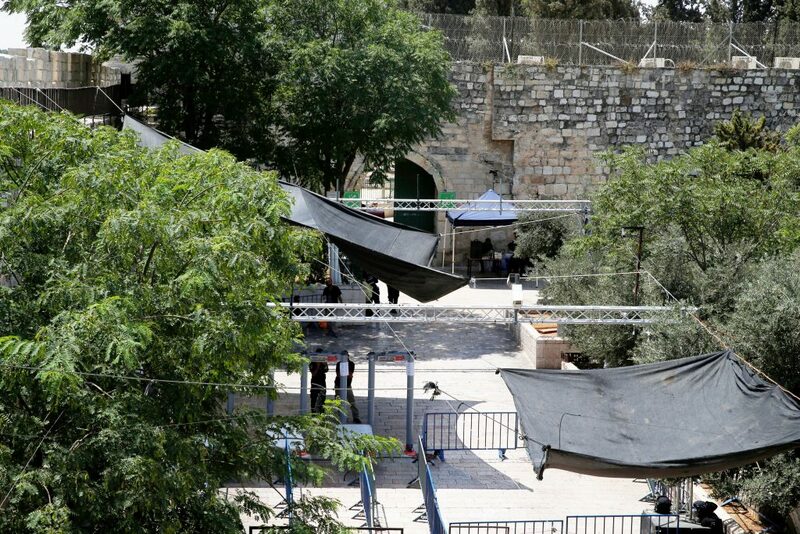 Meanwhile, security officials said Sunday that Israel will not remove the metal detectors, but could eventually reduce their use. “They (metal detectors) will remain. The murderers will never tell us how to search the murderers,” Minister Tzachi Hanegbi told Army Radio. Interviewed on Army Radio, Erdan said Israel may do away with metal-detector checks for all Muslims entering the al Aqsa compounds under alternative arrangements under review. These could include reinforcing Israeli police at the entrances and introducing surveillance cameras with facial-recognition technologies. “There are, after all, many worshipers whom the police knows, regulars, and very elderly people and so on, and it recommended that we avoid putting all of these through metal detectors,” Erdan told Army Radio, suggesting that only potential trouble-makers would be subjected to extra screening. Speaking to Yediot Acharonot, dozens of Arabs who arrived for early-morning prayers Sunday expressed opposition to the placement of cameras at the entrance to the Har HaBayis compound. Those volunteering to speak to reporters said that they would oppose the cameras as fiercely as they opposed the body scanners and metal detectors, and promised that riots would continue until all security measures were removed. The United Nations Security Council is set to hold an emergency meeting on the violence in Yerushalayim on Monday. In a statement, Secretary-General Antonio Guterres condemned “the death of three Palestinians in clashes with Israeli security forces” and called for an investigation into the incidents. “His thoughts and prayers are with the families of the victims,” the statement by Guterres’s office said, urging “Israeli and Palestinian leaders to refrain from actions that could further escalate the situation.” The statement made no mention of the three Israelis, Hy”d, who were murdered as they were finishing Shabbos dinner in the town of Chalamish Friday night.